Love it, Grace. I always have apple butter in my pantry- my favorite is to serve it with brie and a slice of chicken on sourdough bread-tucked under a broiler for a bit. Looks delish. And I'm quite sure the Webster's people are gonna jump all over "moist-iosity" in their next edition!! Oh man, there's this one apple-peanut butter pie I really want to try out. I think you're really pushing me to do it for Turkey Day. And, man do I love a nice crisp apple. The only kind I really don't like are macintoshes. Pink Lady apples are tops in my book though - so perfectly crisp, tart, and sweet! Coconut? Wow! 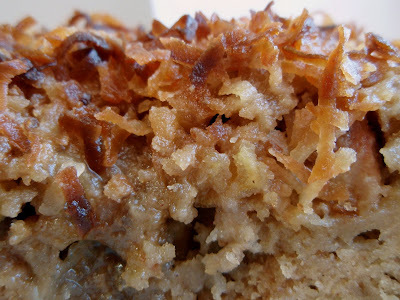 I am so into this...I love moist apple cakes and with coconut it has to be fab! Thanks for sharing. I just bought about bunch of apples to start my apple filled baking. This looks like a good place to start. yumyum. Perfect recipe for the season..
apple butter sounds scrumptious and it does look really really moist! mega-moist!!! hey "mega-moist cooking with gracie". a good idea for a cooking show, no? It looks fantastic! A deliciously moist treat! I MUST make this-I want it now! With these yummy ingredients it has to be so moist and delicious; my hubby will be thrilled! um..yes please. I will let you bake that for me! Come down to Florida in the 100% humidity and you will not have anymore skin crackage! I have been looking for recipes with Apple Butter lately. I had several I planned to try before I got the flu. Now I'm a month behind but I will still be adding this one to the list. It sounds wonderful! Apples are one of my favorite fruits too. I love that you used apple butter in this recipe and coconut. YUM! Yeah, now is apple time & they are the star in our house too! I love apples too, and agree that they belong in many desserts! They actually go with quite a few savory things as well. This cake looks awesome and appley delicious. Someone just gave me a jar of apple butter! I know what I'm making with it! Wow that looks good, really really good! I'd say coconut is a brilliant addition to this cake! Looks delish. Such lovely flavours in this cake and the addition of coconut was frankly quite inspired! I love apple cakes. They always seem so healthy, at least in my mind. Oh I dont think anything sounds better than this right now. Apples, coconut,oats, and apple butter. You make me want to go out and get some. Now. To make this. coconut and apple! great combo, looks divine!! You know the best flavour combinations Grace, this cake looks so moreish! This sounds like everything you could want in an apple cake! The apple butter sounds great too. This is the season of the apple, and apple foods are highly appropriate at this time. How could it not be your favorite fruit this month? Your cake looks wonderful. Looks amazing! I can't wait to try this one. Grace, I need to not visit your site before I've eaten. Fiorst the muffin then a closeup of the apple butter and then a link the pepper jelly? Arrggh! I'm always afraid of winter. I get super dry too and my skin starts cracking. Not fun. Maybe I should make this, purely for medicinal purposes of course. This combines so many of my favorites...apples, oats, coconut...what's not to love?! And I owe you a big THANK you, because I need delicious recipes like this to help me use up my apples! Looks moist and delicious. Perfect Fall dessert. I love a good, moist, appley cake. And apple butter. New convert to the stuff. Yum in a jar. I love, love, love apple season... almost as much as I love any baked good with apple in it. :) This looks awesome... pass the apple butter! I so love apple picken season...everything apple all the time. This looks fabulous my friend Grace. I like what you did with the apple butter - hmmm - I'll bet it made it a completely different cake- er muffin cake. I like it. Apples and coconut - I'm sold!! This is moist definitely one stunning muffin cake! And apple butter? Where has that been all my life? I love every single thing about this moist cake, from the apple butter to the coconut! Such a great idea to add the coconut! Sounds amazing! The addition of coconut and the use of apple butter is just excellent! Oh my goodness,this looks mouth watering!! How delicious! Can I just come over? I really need some of this. Apples, toasted coconut, AND super moist? Yum yum! MMMMMMMMM,...this looks so delicious, Grace!! It sounds heavenly Grace! I'm all about apples in the fall! 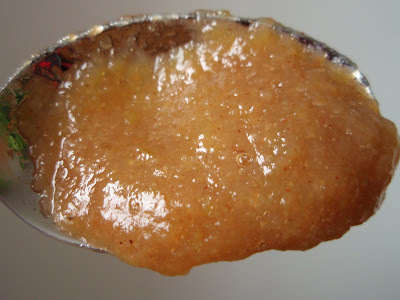 Your apple butter looks light in color to what you get in the store, is it homemade??? Acai of my eye. You are too funny. This sounds absolutely wonderfully delicious! Grace, As usual your prose is as beautiful as your food. I am hoping that you will consider giving all of us a look at the kitchen where all of this happens. Visit my blog for the details. I am a kitchen stalker for sure. I like the word toothy. This cake looks delicious, I can almost smell it! I like that you added the coconut, great choice Grace! I never get enough of apple, love it so much, I can eat it just like that or bake it into something sweet and delightful. The coconut on that cake looks sooo good! What an interesting combination; I don't think I've considered apple and coconut going together. But now that you mention it....it sounds great! Oooh I love a good moist cake to sink my teeth into, this looks amazing. I would also happily eat the sauce off that spoon - gorgeous! 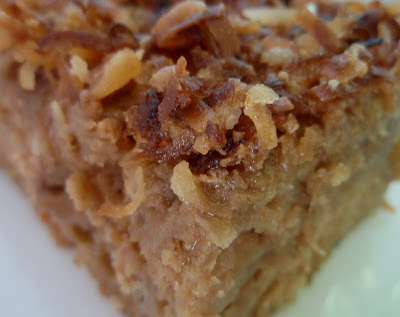 The coconut sounds awesome in here, and along with the oats, I bet this cake has such a great bite. I could go for some now! Apple butter. Now that's an ingredient I have to add into my pantry. Am i guaranteed moist cakes like this? Sign your assurance! Looks delish - can't go wrong with apple butter! Pretty cool blog you've got here. Thank you for it. I like such topics and everything that is connected to this matter. I definitely want to read a bit more on that blog soon.